Richard Kevin Barry was born at Preston, VIC, to John Joseph Barry and Susannah Tulk in 1888. He had three brothers, Henry, Percival and Patrick, who are also remembered in the Avenue. He first enlisted at Bacchus Marsh in August 1914, but was discharged medically unfit in November. On the 7th of March 1916 he again enlisted in the AIF, 14th Battalion, 18th Reinforcements, at the age of 26. He embarked overseas from Melbourne on the 4th of May 1916, aboard the HMAT Port Lincoln. In December he was in France and on the 27th of January 1917 was wounded in action - shrapnel wound to the face. July saw him detached to the 2nd ANZAC Corps school at Rouen - he was back with the 14th Battalion in September. In January 1918 he went AWOL in England for 8 days and served 21 days in the Detention Barracks before rejoining his unit in May. In July he was admitted to hospital with Influenza then, transferred to England, 1st Australian Dermatological Hospital, Bulford Camp and later transferred to the Convalescent Depot with Vertigo and Headaches - a side effect of the Influenza. He embarked for Australia aboard the City of Exeter in January of 1919, arriving home in March and was discharged from the AIF on the 9th of April 1919 - medically unfit. Richard Kevin Barry died at Bacchus Marsh, VIC, on the 3rd of February 1922, aged 33. 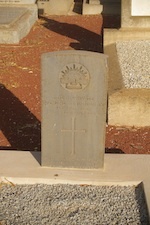 He is buried at Maddingley Cemetery, Bacchus Marsh, VIC. At some point his Service Number was changed from 5329 to 5649.